Happy Meal and I spent a handful of hours at the California Science Center, and by the time that 2:30 rolled around, I was dizzy from hunger. We fought the nonsensical traffic to downtown LA, fed the meter 3 bucks for an hour of parking, and got ourselves into Blu LA Cafe. The smell of beef cooking on the griddle was, what I hoped, a sign of good and cheeseburgery things to come. We ordered a Blu LA Cafe Burger and a Cheeseburger from a sweaty and flustered waiter. We were one of only two tables, so his demeanor was puzzling. Getting a straight answer on the ingredients was a challenge, as well. Frankly, I couldn't tell you where the buns came from, and the meat supplier continues to be a mystery. The name of the bakery was related by another staffer as the Cordera Bakery, but I couldn't find one of those, or anything like it, when conducting a search. So it goes...it's hard to find good help during a recession....no, wait...that didn't make any sense. The Beef: Typical, 80:20 medium grind, of pre-ground, 100% Angus chuck. This beef had a very strong dry-aged flavor to it, and that funky gaminess really carried the burger. It was almost visceral in its scent and flavor. Again, I have no idea where it came from, but beef like this gave chuck a good name. It tasted and smelled downright X-rated. 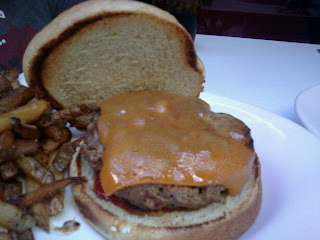 The Sear: NICE--the nailed the crunchy sear by cooking this burger on a hot griddle. The Seasoning: They dusted the outside with a mild, seasoning blend. Like the Nook burger, the interior was unseasoned, but the strong beef flavors carried the dish. 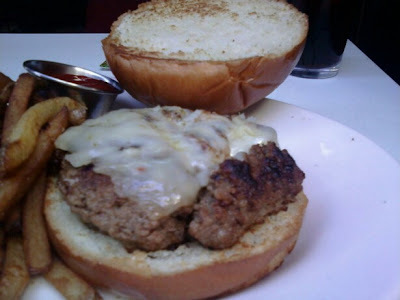 The aged funk was more than enough in the case of a burger at Blu LA Cafe. I would have guessed both establishments use the same beef. The Cheese: I had my cheeseburger topped with Monterrey Jack, well, that's what I asked for....what I got was red flecked, Pepper Jack cheese, but it was fine--still it would have been appropriate for the waiter to relate the cheese options accurately. The standard cheeseburger came with competently melted Cheddar. The Preparation: Both cheeseburgers came out overcooked to Well in spite of the fact that I called the waiter over and confirmed that they would be cooked to Medium. Even more puzzling was that my burger came out with crispy bacon on top--huh? It was not on the menu, and I didn't want it, and I certainly did not request it--Happy Meal made quick work of the bacon, though. In spite of all of the blundering, the beef carried the dish over these obstacles--it was juicy enough to compensate for the ham-fisted preparation. The patties were formed very loosely. This created a spectacular and moist mouth feel without a trace of the rubbery character that one would have expected from pre-ground, overcooked chuck. This also allowed a fair amount of the fat to render out as they overcooked the meat. That was a mixed blessing, but I'd go with fortunate accident. The additional fat was not missed. The Bun: Mine was an HUGE, dry, bland, cool wreck of a brioche. I discarded the weakly toasted top bun halfway through, and that solved that problem. Meanwhile, the standard, seeded burger bun was perfect for the cheeseburger on Happy Meal's plate. 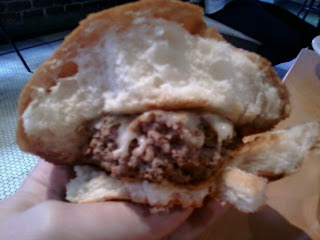 Meat to Bun Ratio: In the case of the signature burger, the bun grossly over-matched the beef. In the case of the standard cheeseburger, the ratio was perfect. The Fries: These were just fine--cut in house--cooked to a deep and crisp finish. They were immensely bland, but the salt on the table set that issue to rest. The Value: Like The Nook--this burger came in around 12 bucks, and it would have been nice had they listened to my order and delivered what I had asked for. If I were to go back, I would save a couple bucks and order the Cheeseburger--the brioche cost more, and I threw away half of it. 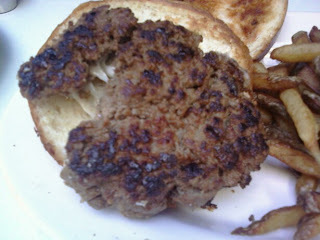 The burger, when served on the on the standard bun, was far better, and they used the same beef. Burger Review : A really good burger in spite of blundering efforts in both the front and back of the house. Honestly, any place that stamps "best burger" on its menu should educate its staff as to what makes that burger "best." Blu LA Cafe should call their beef supplier and thank them for providing idiot-proof chuck. Editor's Note: We believe that the buns were sourced from the Ca'd'Oro Bakery.